Merry Creepmas to all! 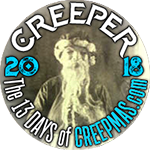 I’m so excited to be bringing a bit of Halloween cheer into December by participating in the 13 Days of Creepmas. What is Creepmas you ask? This is the season where Halloween lovers and Halloween online content creators share frights, delights and spooky things to keep the spirit alive. Just as retailers roll out all things Christmas in September and make us feel the Holiday stress before Halloween comes around, us creepers strike back with chills and thrills to bring out the most unusual, strange and creepy things about the holidays! Be sure to visit the Creepmas website to see all of the bloggers and folks online who will be sharing Creepmas ideas from Dec. 1 – 13. I’ll be posting some fun recipes, ideas and outfits for my first Creepmas.